I don’t have very many food hangups but the ones I have are well established. I will not eat pickled beets, pickled herring, liver and onions, tacos, sushi, or fudge. It’s a very random list and there really is no connection between the items other than I will go out of my way to avoid eating them. Donuts used to be on that list after working at a donut shop in high school. I would leave after a shift and the smell of donut grease was on every strand of hair, every fiber of my clothing, and even my shoes and socks. After a very long estrangement, donuts and I are finally back on friendly terms. In that example, the food hangup was the result of being exposed to the food for prolonged periods. However, sometimes the food hangup predated any long term exposure to the target food so that the eventual exposure was made all the more painful. Fudge falls squarely into that category. It’s not that I just don’t like fudge. I HATE fudge. I hate the texture and the cloying sweetness of it. I hate the way it smells. To me, there is nothing good about fudge. So imagine the irony of me working in a fudge shop. For six to ten hours a day, six days a week, I was surrounded by fudge. Chocolate, peanut butter, chocolate peanut butter, pistachio, vanilla swirl, rocky road, chocolate pecan, vanilla walnut, chocolate walnut, maple walnut filled tray after tray in the display cases. I think the worst offender was the penuche. Penuche is fudge like candy made from brown sugar, butter, milk, and vanilla. The smell of it would make me queasy. Even thinking about it now, nearly 20 years later makes my face squinch up like I’m tasting something bad. Day after day, I would don my candy shop uniform and serve up fudge, candies, salt water taffy, and ice cream to beach going vacationers. If fudge hadn’t been on my forbidden foods list before then, that summer job alone would have cemented its place on it. I didn’t last the whole summer at that job and I blame it on the fudge. There wasn’t enough gummy fish, fruit slices, or frozen yogurt in that shop to make me forget about the fudge. I finished out the summer at a record store a few doors up from the candy shop. I would wave as I walked by on my way to or from the record store, thankful that I no longer had to touch, cut, or smell fudge ever again. Or so I thought. Flash forward about 20 years. 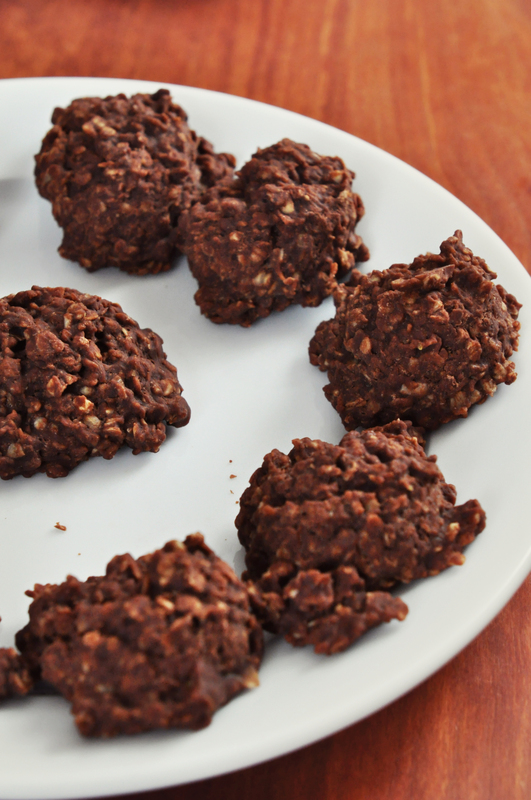 Brooke over at Shutterboo posted about Chocolate No Bake Cookies. Everything she said made me want to go home and make them immediately. No bake. 10 minutes. Chocolate. All good things in my world. Nowhere in her fawning did she happen to mention that the cookies have a fudge like texture. So imagine my surprise when, after much anticipation, 10 minutes of cooking and another 10 minutes of cooling, I took a big bite of a chocolate no bake cookie and had a mouthful of fudge. If it weren’t for the fact that I had guests at the time, I would have spit it out. But seeing your hostess hawk a wad of partially chewed cookie across the room is not what one expects in polite company. So I grimaced and got through it. Sorry Boo, I know you believe these cookies have a place in heaven but we did not make a love connection. Me loves cookies as much as you do but on this one, we will have agree to disagree. Y’all can have all the Chocolate No Bake Cookies you want; I’ll even help you make them. I just won’t eat them. Measure out the oats and peanut butter into a medium bowl and set aside. Line two sheet pans with parchment paper and set aside. Bring the butter, sugar, cocoa powder, and milk to a boil in a medium saucepan. Let it boil for one minute. Remove the pan from the heat and add the oats, peanut butter, and vanilla. Carefully stir until completely combined. Use a small ice cream scoop to portion out the cookies onto the parchment paper. Let cool completely before eating. I never thought of them being fudge-like but then again they are flourless. I’m so sorry you didn’t like them – my Mom made them all the time when I was growing up and it reminds me of my childhood. Even PodMate says it reminds her of kindergarten [but not her go-to cookie]. Mind you, she still eats them when I bring them to work. I’ll find you a cookie that you’ll love – that we’ll both love – I can’t leave you hanging like this. Boo, if you could have seen my face when I took a bite of these cookies…priceless. I adore you but not your favorite cookies. Sorry hon. My mother worked in a candy store as a young woman…….took her a long time to like candy again after that…….I empathize BUt as fudge is on of my very faves from childhood…………any kind Mommy would make was fine Poppy voted for Peanut butter every time…was fine with me. I love anything that is no bake. the oven here is not always my friend. Emily, these no bake cookies may be a perfect match for you. Give them a try and let me know what you think. Love the story – too funny. You are very generous though to share the recipe here even though you didn’t like it! I had a similar high school employment scenario with ice cream. I never wanted to eat it when I smelled like sour milk all the time from having it up my arms from scooping down into giant 6 gallon tubs. Jennifer, I always try to remember that even though a recipe doesn’t win me over, someone else may love it. And in the instances where I can’t get it to work, I know that it’s usually my fault and that somebody else may be able to succeed where I failed. Wasn’t scooping ice cream brutal? Bending into those cases, down into the tubs. And god help you when the ice cream was rock hard. Hahahaaa, you made me laugh with this one Wendi, funny how childhood memories leave a person huh. Anna, I have been scarred for life by fudge. Just the thought of it makes me shudder. I got sick eating tacos one time. took me FOREVER to eat another one. Here, if I didn’t eat them I would probably starve. I think I have the makins’ for these cookies. will try maybe today…with nuts maybe? Good luck with the cookies Emily. Aww, I’m sorry you were disappointed with the cookies. I’m on the other end of the spectrum; I hardly ever get to eat fudge because it’s always processed with peanuts/nuts….so when I can have it I am so excited – I’ll definitely have to give these cookies a try! This is why I post recipes even when I don’t j’adore the dish. Tracy, I hope that these cookies will bring you fudgey happiness. This post made me giggle. My dad is 57 years old, and loathes pizza after spending his last 2 years of high school working part-time at a pizza shop. Apparently this is a fairly common reaction to food-based jobs! I gotta know – what’s your beef with tacos? Is it all tacos? Hard shell and soft? Corn and flour tortillas? Chicken, steak, fish, AND ground beef?! How do you feel about the wonderful Choco-taco? Jacki, I’m telling you some of these food experiences can damage you for life. Slinging pizza, scooping ice cream, flipping burgers, they all leave scars. The taco incident happened when I was about 13. It involved Old ElPasso, a strong does of antibiotics, and a lack of understanding why you aren’t supposed to take the medicine on an empty stomach. I’ve pretty much excluded all forms of tacos from my diet from that day forward. I can sometimes eat the components individually, think deconstructed, if I absolutely have to. But those moments are few and far between. Choco taco? Was is das? You don’t know the choco taco?! It was my favorite thing from the ice cream man when I was a kid. Picture a round flat waffle cone, bent into a taco shape. Inside it has a layer of soft chocolate goo on the bottom, then it’s filled with vanilla ice cream with a chocolate ripple, and finally they dip all of the edges in liquid chocolate and then peanuts, so it makes a hard shell that holds it all inside in case the ice cream melts a bit. To a child, it’s basically heaven, “Mexican” style. Jacki, I’d totally be on board with the choco taco since it is a taco in name only. And since it has ice cream and a layer of chocolate. How is it that I’ve never encountered choco taco before? I like fudge, but only in small doses because it’s so sweet. Are these cookies super sweet like that, or is it only the texture that’s similar? Jen, I couldn’t get past the texture so I wasn’t paying as much attention to the sweetness. But I don’t seem to recall them being sickly sweet. Then again, I’ve tried to purge the memory of this cookie from my mind.